I cannot believe it is already 2019, and we are starting to wrap up our next Puget Sound edition. 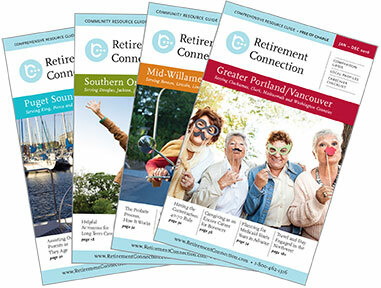 Retirement Connection is printed annually, and the next one will be out in April. Please email me any additions or edits that you want to be included; I want your insight, so we can continue to grow and improve. SASH meetings will NO longer meet. SASH has hosted their last coffee time but the connections, relationships, and teamwork will continue for years to come! Thank you for being a part of a wonderful monthly tradition since 2006 in the Puget Sound elder care community! I cannot even count the times I start a new year, planning "to be healthier, blah blah blah", Recently someone told me to really think about WHY I set a specific goal, and that will help me achieve it. Sitting on the couch watching HGTV wasn’t helping, so I changed my habits- and now the rest is starting to change as well. I realized that what I wanted most, is more important than what I may want at the moment.